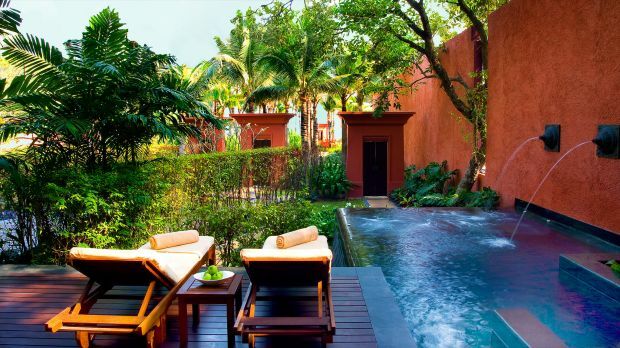 Enviar solicitação de disponibilidade com as datas desejadas para THE BARAI at Hyatt Regency Hua Hin. Located on the upper floor, suite offer a spacious private balcony with spectacular views of the Gulf of Thailand. Guests will enjoy an over sized king bed, individual walk-in closets, vanity area, private spa treatment area and dining area. The suite offers personal butler service, complimentary broadband Internet access and complimentary laundry service for two items per day. Daily breakfast included, at McFarland House, all-day hot and cold beverage and pre-dinner drinks and snacks at McFarland House. Residential spa suites, designed for overnight stays and spa treatments. Located on the ground floor, the suites feature a private plunge pool, garden, individual walk-in closets, vanity area, private spa treatment area and dining area. The suite offers personal butler service, complimentary broadband Internet access and complimentary laundry service for two items per day. Daily breakfast included, at McFarland House. Features a plunge pool, outdoor shower, butler service, flat screen TV, Wi-Fi Internet. Rate includes 60 minute massage, breakfast and cocktails.